“A brain freeze and then you melt it,” is how Shelli Chan describes her new business in the Mill Creek Town Center. Chan’s patrons can get frozen yogurt, specialty coffee, juice, and specialty snacks such as Macaron Pastries in a clean, high-tech environment. The World's Tastiest Frozen Yogurt and The ABS Coffee Company opened across the street from Boston’s Pizza in March. The brightly-lit high-tech interior is very inviting. 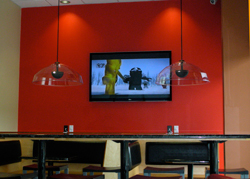 There are six flat-screen TVs mounted on the walls. Two of the booths allow patrons to connect their iPods, iPhones, or other music players to sound dome speakers for individualized entertainment. Choices abound with 16 self-serve frozen yogurt machines, each with a different flavor. There are some unusual flavors to try such as watermelon, pistachio, maple bacon donut, and honey lavender. Toppings include fresh fruit, nuts, granola, sprinkles, and gummi bears. Chan is very particular about her coffee. Her supplier is Caffe Lusso, a high-end specialty coffee roaster in Redmond. Caffe Lusso buys their coffee directly from the farmers whenever possible and roasts on demand in order to ensure freshness.